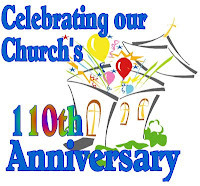 My church back home in San Diego, First Congregational Church of Ramona, is 110 years old this year. It's reassuring to know there is some history and roots in this church. God has been moving and changing us for 110 year with the same breath with which he raised Jesus from the tomb. It's a bitter-sweet year, because this year is also our Pastor's (Alex Dreese) and my hero's last year at our church. He's been with us since before I was alive. He has been such an invaluable part of my spiritual growth that I surely would not be the same man I am today if it were not for his influence. As of June this year, he will be taking off into a new phase of life (interim pastoring for churches in need). Our church and I will miss him more than any of us can know. You know how there are just some people in the world who just get it? They live life with such love and compassion that words are rarely necessary. You feel like you just want to get inside their head and see what makes them such good people. Alex Dreese is one of those people. Oh, if only to live such a life... May we learn from these sort of lives, may we learn to speak loudly and aggressively with our lives before ever we speak at all.